New Zealand warms the world with its famous merino wool. But where pastureland gives way to cloud-capped peaks, the top commodity is white fluff of a different sort. New Zealand tour happening now! Don't miss the shows in Christchurch and Wellington this weekend (May 25 & 27). Arrowtown, Nelson and Tauranga to follow soon. More information on screenings can be found here. 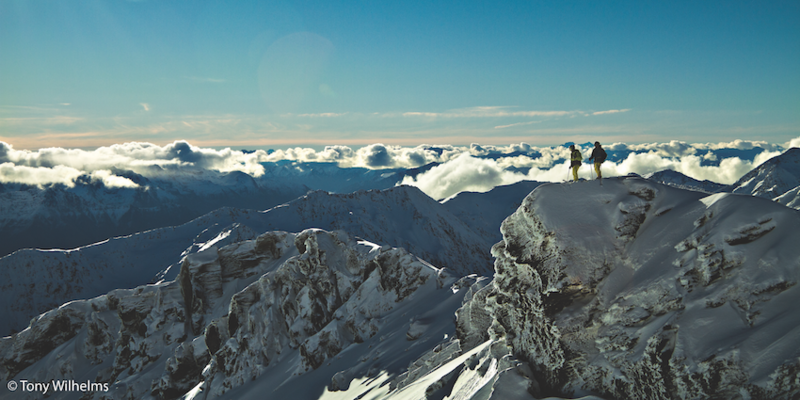 The New Zealand ski season runs roughly June - October. Mirroring the Northern Hemisphere, June marks the end of Fall and resorts begin to open as temps drop and snow starts falling. October in New Zealand brings Spring weather, and most resorts start to close in the first week. You can still find snow later in October if you head up to the North Island. New Zealand's mountains, young by geological standards, tend to be steep and rocky, while maritime climate provides a generous and stable snowpack. Southern Lakes Heliski operates out of Queenstown and nearby Wanaka, and, depending on the day, offers access to as many as 400 different runs on Clarke Glacier in the Forbes mountain range. The terrain includes wide-open bowls, steep spines, and all manner of intriguing mini-golf lines and features. Guests are provided with an NCMGA-certified guide, plus beacon, shovel and probe instruction on how to use them. NZ Skier – Magazine on Shelves now. SnowCentre in Auckland for all your snow needs.